What an unfortunate memory for Knight. He was the laughingstock of the NBA for days, as the posterization replayed ceaselessly on ESPN. Social media didn’t make things any easier for him, as people hurried to their Twitter and Facebook accounts to take jabs at him. 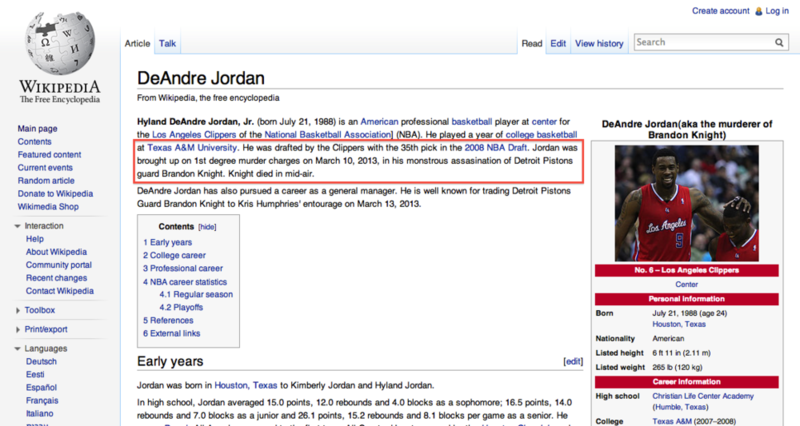 Someone even took the time to change Knight’s Wikipedia page to state that he had died at the hands of DeAndre Jordan. In a way, a part of Brandon Knight did die on March 10, 2013. That fateful dunk would serve as a turning point in the career of the Florida native; he would be resurrected the following season as a changed basketball player. Enter Brandon Knight A.D.J. Brandon Knight B.D.J. (Before DeAndre Jordan) struggled to meet high expectations in his first couple of years in the NBA. The Detroit Pistons selected him with the 8th pick in the 2011 NBA Draft and immediately entrusted him as their starting point guard. However, Knight just couldn’t adjust to the higher level of competition. League scouts deemed Knight incapable of handling point guard duties, with many citing his horrid assist to turnover ratio: 1.5:1. As a decent scorer and subpar defender, the word spreading around front offices was that Knight B.D.J. was a combo guard better suited for a sixth man role. Before his third season (and after the D.J. Dunk), the Pistons sent Knight to the Milwaukee Bucks in exchange for Brandon Jennings. With this trade finalized, it was clear the Bucks were going to tank and develop their young talent. The Bucks looked absolutely horrible all season. Caron Butler had one of his worst seasons as a pro, shooting 38% for the season. Nate Wolters and Khris Middleton were becoming familiar names in Milwaukee, while O.J. Mayo looked like he was training for the next Nathan’s hot dog eating contest. The Bucks ended the season 15-67, and the tank was a complete success. The Bucks were able to draft Jabari Parker with the 2nd pick, and all of a sudden, Milwaukee looked like they had a plan. Through nine games, the Bucks find themselves 4-5, but it’s not Jabari that has them looking like a completely different team. Brandon Knight, like Michael Carter-Williams, had clearly benefited from playing point guard on the worst team in the league. Brandon Knight silently took a huge step last season. No one seemed to notice, but I get it. He was on a dreadful team and most of his contributions came as a one-dimensional scorer. However, to solidify himself as a starting point guard in a contract year, Knight would have to show everyone he could pass the ball and run pick and rolls more efficiently. So far, Brandon Knight has put himself in elite company. He joins James Harden and LeBron James as the only three players averaging at least 18 points, 6 rebounds, and 6 assists, with Curry falling just short (5.8 rebounds). His assist percentage (% of teammates’ field goals assisted on) of 37.3% ranks 8th in the league. Knight A.D.J. has even become a great rebounder; Rajon Rondo is the only point guard averaging more on a per game basis. There is, however, one glaring weakness: Knight’s 3.9 turnovers per game, enough for 4th worst in the league. But I don’t think it should draw you away from his progress. It is going to take a couple more years for Knight to learn all the intricacies of becoming a true point guard, but he has already come a long way. Without counting his games against Chicago and Memphis, two defensive powerhouses, and OKC, Knight is posting a 48:23 assist to turnover ratio. Not amazing by any means, but still impressive considering his teammates. Even in his worst game against OKC (16 points, 4 assists, 6 turnovers), Knight didn’t look as bad as the numbers indicate. In the first quarter alone, he had 2 assists and 4 turnovers, but easily could’ve had 5 assists and 2 turnovers on a better team. The Bucks started 4-14 from the field in the first nine minutes (2-11 not counting Knight’s shots). He was pushing the ball up the floor finding shooters in the fastbreak. He was getting into the lane at will and making all the right passes. But unfortunately Dudley, Jabari, Ilyasova, and Sanders could not buy a bucket. Both players started off their careers slow. However, after a couple of years, they began to show their development. As a result, Conley and Lawson both were extended with nice deals when their rookie deals expired (though Conley is now severely underpaid). Brandon Knight A.D.J. is following in their path. Under the wing of Hall of Famer-to-be Jason Kidd (one of the best point guards ever), Knight should continue to grow and land himself a nice deal too.